How to Share Files Between Computers Through Wireless? If you own a laptop and a desktop PC, you can easily transfer files from one machine to the other by setting up folder sharing. The same does to two laptops, two desktops or any other combination. This is a built-in feature of Windows. It is a fairly simple process, which should not take more than a few minutes to complete. Step One: Make sure to connect the computers to the same wireless network. Step Two: Find the folder that contains the file you want to share. Right-click the folder and click “Properties”. Step Three: In the properties window, select the “Sharing” tab. Click “Advanced Sharing” in the center of the window. 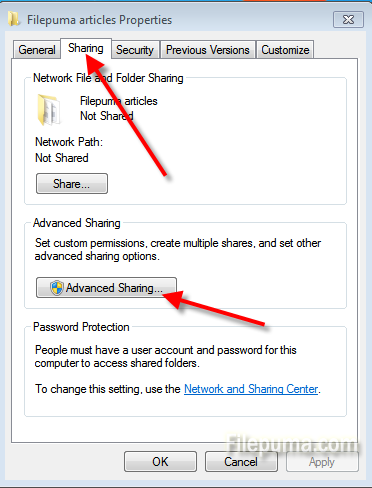 Step Four: Check “Share This Folder” and set the number of simultaneous users and who has the permission to this sharing folder. Click “OK” to share the folder.